I was just sitting at Starbucks Uptown while waiting for my bf's car to service. Drank Ice Lemon Tea and pick up a copy of MYC! News Magazine (short for Malaysia College). 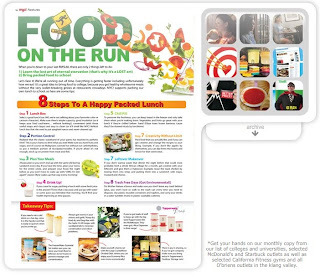 I browse and saw the Page title Food On The Run talking about 8 steps to a Happy Packed Lunch. I recognized a picture of a bento on this page of a Totoro holding up a watermelon. It belongs to Anna The Red's bento creations! I am 100% sure it's her bento image! so I got on my blackberry wifi and checked out Anna The Red's Bento Blog. True enough it's her bento image and I notice MYC! News kinda "hide/cover" her name watermark on the image (bad!). They didn't even mention it's her fabulous bento creations/image. I wonder if they even asked for her permission? anyway this gives me a good chance to tell you all about her Bento Blog if u people don't know about it yet. Just looking at her bento pictures makes me... feel like making a anime bento (but I know I won't be able to do it as good as Anna's!). 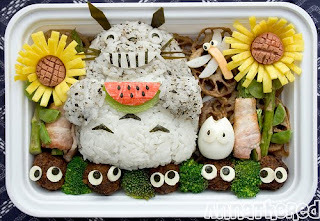 Anna The Red's Totoro Bento! Check out more cool bento making creations and yummy bento pictures from Anna's bento blog by clicking the link above. During days that I need some creative juice pumping, I'll be reading her blog. It's totally amazing, even Google Chrome asked her to do a Google Chrome Bento! and she has a video on how she did it as well..which is totally cool.